Congrats Graduate Cardboard Cutout Standup Prop - Dino Rentos Studios, INC. 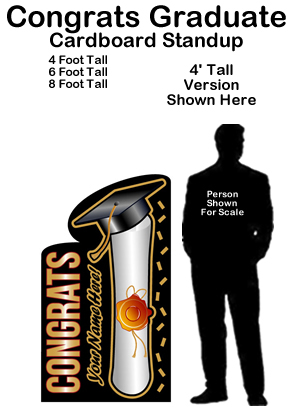 This Congrats Graduate Cardboard Cutout Standup Prop is great for your grad's party or celebration! Show them how proud you are by having this as a decoration for their graduation themed event. You can even customize it with their name! Just add your Grad's name when ordering and cutout will read "CONGRATS <Your Grad's Name>!"